Candice Walsh grew up in the small town of Oxford, NC, just north of Raleigh. She received a Bachelor's of Science in Business Administration with a concentration in Marketing and a minor in Psychology from Peace College in Raleigh, NC. She later received her Master's in Social Work from Western Carolina University. Candice joined The Boys & Girls Club in August 2014. Candice was attracted to the Club for the incredible service it provides to the youth of Transylvania County and she feels so blessed to be a part of such an incredible movement that is impacting the lives of so many. In her free time, Candice enjoys spending time with her family and exploring the many waterfalls, hiking trails and other outdoor adventures that Transylvania County has to offer. She lives in Pisgah Forest with her husband, Sean Walsh and daughters, Emma Beth and Corbyn. Sarah Rae St. Marie grew up in Cambridge, ON, Canada, and moved to Brevard, NC in August of 2011. Sarah received her Bachelor's Degree in Sociology from The University of North Carolina at Pembroke. Sarah started with The Cindy Platt Boys & Girls Club in April of 2013 as a part-time Program Specialist, and has since then served in many roles. In addition to her time at the Club, Sarah also spent a year and a half in Orlando working for the YMCA of Central Florida in Youth Development. She is thrilled to be back at the Club where she can work alongside an incredible staff team, and serve an exceptional community. Sarah lives in Pisgah Forest with her husband, Kiffer St. Marie - and together they enjoy traveling, visiting National Parks, and spending time with family. Jamie Atkinson grew up in Spartanburg, SC. She attended Brevard College and received her bachelor's degree in Mathematics with an emphasis in secondary education. She was a student athlete in college and says that being a student athlete was one of the most valuable experiences she has ever had. She is currently pursuing a Masters degree in Nonprofit Management from the University of Central Florida. She began working at the Club in November of 2018, after a five year career in higher education. Tamika Hunter is originally from the Chicagoland area and received her Bachelor’s Degree in Health Care Administration from Northern Illinois University and her Masters of Business Administration from The University of Phoenix. Tamika believes that Purpose and Passion is everything. And when you discover it, you pursue it. One of her purposes and passions is working with youth. Empowering them and helping equip them to live a life of meaning. As a result, she started a teen girls mentoring agency, Dare Dreamers, where she mentors young ladies between the ages of 12 and 19. She is also a certified Life Purpose Coach for women and youth and enjoys motivating and encouraging others. Tamika comes to us with over 15 years of experience in corporate America as a consultant, but is most excited about having the opportunity to share in the lives of our members and their families at the Cindy Platt Boys & Girls Club. Tamika is married to Earl and is the mother of an amazing son, Dillon and vivacious daughter, Gabrielle. Courtney Hoffses was born and raised in Aroostook County, Maine. She graduated from St. Joseph’s College of Maine in 2012 with a Bachelor's Degree in Political Science with dual minors in History and Sociology. She went on to receive her Master’s Degree in Intercultural Youth and Family Development in 2015 from the University of Montana. While completing her Master’s Degree Courtney interned at a Refugee Resettlement agency in North Dakota. Courtney moved to Western North Carolina in 2015. She started at the Club as a Program Specialist in September 2016 and is very excited for the opportunity to help grow our program for middle schoolers. In her free time Courtney enjoys hiking, reading, being outside, and cooking. She lives in Brevard with her boyfriend Matt and their black lab Monte. Mary Jay was born and raised in South Carolina, spent 10 years in Pensacola, Florida and has now resided here in North Carolina for five years. She is a third generation educator with eight years teaching experience in pre-K through seventh grade. Mary graduated in 2005 with a BA in Missions with emphases in teaching and English. In addition to teaching, she has also had the opportunity to work as an assistant director of an after-school care program and to teach overseas. In her free time, Mary loves spending time with her family, cooking, reading, and enjoying the beautiful outdoors. 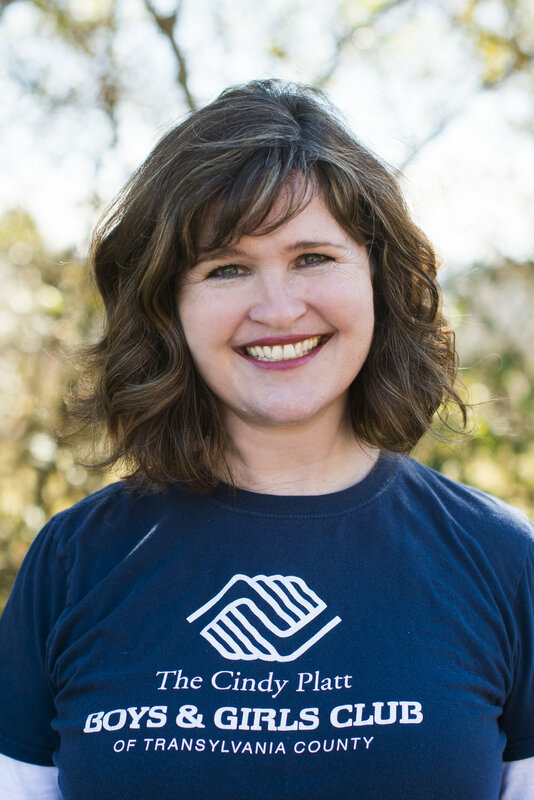 Mary is thrilled to bring her varied experiences to the Cindy Platt Boys & Girls Club and focus on giving each member all the help and encouragement they need to discover positive learning and study habits. She feels it is a tremendous honor to be a part of a focused and alive organization that has a real, everyday impact on young people. Devon Holmes grew up in Conyers, Ga, 20 minutes east of Atlanta. He landed in Brevard on a football scholarship to Brevard College. Majoring in Political Science & Education (with a minor in Business & Organizational Leadership), he received his Bachelor's Degree in 2014. He began working at the Club during the second semester of his senior year as a Program Specialist after football ended. Devon quickly found his niche in the gym, leading Triple Play and encouraging our kids to get active. He has also worked at Brevard High School and currently works for Family Preservation Services, as a Vocational Counselor on an Assertive Community Treatment Team. He enjoys spending time with family & friends, shopping, and traveling. He has a passion for coaching flag football and empowering our youth to reach their fullest potential. A resident of Brevard since 2013, Glenn and his lovely wife, Jan moved from Michigan where Glenn worked in the printing industry for over 25 years. Prior to joining the Club family, Glenn served in facilities at Brevard College. Outside of keeping our facility, grounds and equipment in tip-top shape, Glenn enjoys golfing, fishing, riding his motorcycle and golfing some more. If he isn't at the Club enjoying his work with so many wonderful people, you can definitely find him on a golf course. Kathleen de la Torre grew up in Jacksonville, Florida. She received her Bachelor’s Degree in Mathematics from Wake Forest University in Winston-Salem, NC a very long time ago. She is married to Ernie and they have two kids, Asher and Anna, and a very demanding rescued dog, Dan. Her kids became members of the Club when they moved here in 2011 and they participated in the Junior Appalachian Musicians program (JAM) for many years. After serving on the Board of Directors for five months, Kathleen accepted the position of Finance Director in 2015 and served in that role for over 3 years. She is now thrilled to serve as the Club’s Resource Development Director - channeling her love and support of the Club to expand the outreach of the Club’s donor support base. She is honored to support the mission of The Cindy Platt Boys & Girls Club. Kathleen enjoys scuba diving with her family and supporting her two high school aged children! Karen Phillips grew up in Southwest Georgia in the town of Albany. For years her family longed for a permanent home in the mountains of Western North Carolina. They eventually found that home in the friendly town of Brevard and moved here permanently in June of 2017. Karen received her Bachelor’s of Science in Special Education and Early Childhood and then her Master’s in Instructional Technology from Georgia Southern University. Her many career hats she has worn include classroom teacher, media specialist, computer/technology specialist, and grant writer. Her focal point in the workplace has always been helping children discover their unique path of happiness and success. She joined our team here at the Club in March of 2019. She is thrilled to be involved with an organization so devoted to helping children reach their full potential. In her down time Karen enjoys hitting a local trail, hillside or waterway with her husband Paul and their three boys AND ending the day in front of a fire with a family dog or cat on her lap. Gina Malefyt loves coordinating and implementing events - navigating all of the big and small details. Gina is thrilled to be working with the Club helping plan and implement their annual Bent River Farm Benefit Dinner. She and her husband, Joel have lived in Brevard for several years having relocated from Colorado. They have a daughter, Ruby and enjoy taking trips and making memories together as a family. Gail and her family have lived in the Brevard area for 25 years after moving from Atlanta. She comes to the Club with 16 years experience in the school system, working with general classroom programming and, more specifically, needs-based instruction. Her time there allowed her to master the entire process of identifying and assessing needs, creating an academic plan, and seeing that that plan was successfully carried out. As Assistant Education Director, Gail has made flexibility for the student’s good and a dedication to continuous re-designing of assistance plans the basis of her individual instruction.Gail’s time at the Club is focused on having a heart for the kids and helping them grow to reach their full potential. Her mission and passion is to be able to meet each need that members bring to her. Outside of the Club, Gail loves spending time with her husband and daughters, reading, and enjoying the perks of living in Transylvania County. Jaime Frost grew up in the suburbs of Philadelphia, Pennsylvania, where most of her childhood was spent in a dance studio. This lifetime passion inspired Jaime to seek certification as a group fitness instructor upon her arrival in North Carolina in 2011, attracted by her love of mountains and waterfalls. It was that continued dedication to fitness and the nutrition it necessitates that drew her to the Club in February of 2017, to serve as the assistant to the Health and Wellness director. Jaime’s affinity for gardening blossomed quickly here in the Harvest Project produce garden, and her energies at the Club continue to primarily be dedicated to it and the Healthy Habits program arenas. She lives in their own little slice of the woods near the Pisgah National Forest with her boyfriend, teenage stepdaughter, and 6-month old son, with whom she is enamored and intends to teach to tap dance as soon as he can walk. Shirley Cox moved to Transylvania County in 1982 and has been involved in Early Childhood Education and the care of school age children since then. She received her Bachelor's of Science in Home Economics Education from Messiah College in Grantham, PA. Shirley worked for/owned a local childcare center for 24 years. After a short term with an after school program, she was employed full time by The Club for 7 years. Circumstances caused her to take a break but her love of The Club and its mission brought her back to a part time position. Shirley is married to Jim and has a grown daughter, Rebecca. She is very involved in her church and loves to sing. Margaret Jay was born in Mansfield, Ohio, but only lived there three years before her family moved to Athens, OH. After that it was off to Boston, MA, and then to Columbia, SC, where she first met her husband, Joe. She returned to Ohio where she received a Bachelor's degree in Sociology and American Studies at Wittenberg University in Springfield. After moving all over the country and homeschooling her children, In 2013 Margaret and Joe finally settled in Brevard where she has worked as an administrative assistant in a small school. During all these moves, Margaret has been involved with children and young people and parents in some capacity whether at work or at church. Since her days after school at the "Y," she has a great desire to see the next generation grow both in body, soul, and spirit into healthy individuals. To do this takes the support of many hearts and hands working together and it is Margaret's hope that she can provide some of that support to the members and their families and the staff of the Cindy Platt Boys & Girls Club. The club also employs 20 - 35 part-time staff throughout the year. To learn more about our open positions, please visit our Careers page here.